Following the meetings of academics, developers and users of real-time and embedded Linux at the previous 11 real-time Linux workshops held world-wide (Vienna, Orlando, Milano, Boston, Valencia, Singapore, Lille, Lanzhou, Linz, Guadalajara and Dresden) - the Real-Time Linux Workshop for 2010 will come to Africa for the first time. It will be held at the Strathmore University in Nairobi, Kenya, from October 25 through 27, preceded by one week public seminars. Embedded and real-time Linux have been rapidly gaining traction in consumer electronics and made significant advance into industrial computing. 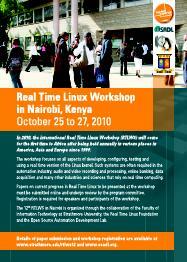 Today, Linux runs a wide range of industrial applications including real-time and safety-related systems. This vast pool of technology not only has the potential to improve the capabilities of computer systems in general but also has the ability to include new regions of this world into this creative process. These regions have been excluded so far due to the economic constraints involved with proprietary development models. Opening the door for the creative potential of engineers in Africa, exchanging ideas between diverse technical cultures is an essential contribution to advancing the capabilities of Open Source. Upon acceptance of an abstract by the RTLWS12 Program Committee, the author will be invited to submit a full paper in a form defined by https://www.osadl.org/paper.tgz. A detailed description of the editing and formatting process will be provided along with the notification email. This Call for Papers is also available as plain ASCII text. Please use the ASCII form to forward this information via email and to post it into mailing lists. The direct link to the text is https://www.osadl.org/rtlws12.txt. If using public transport, take matatu number 14, which leaves town from Bus Station and goes directly to the entrance of Strathmore University (the last stop). Click on the red pin marker of this map to display a street map of the location and calculate directions to it. To learn about Kenya, please refer to the country's official Homepage at www.kenya.go.ke. The Faculty of Information Technology (FIT) is one of the main faculties of Strathmore University. It offers an undergraduate curriculum and graduate programs. In addition, Strathmore launched its first PhD program in 2010. The undergraduate curriculum is based on scientific principles and fundamentals that are applied to integrate technology, information and people to create knowledge that contributes to our culture, economic well-being and quality of life. The graduate programs aim to produce top professionals that offer cutting-edge research, innovation and scholarship. To be successful, the faculty depends on partnerships that start with staff members and students and extends university-wide and to other institutions and organizations in Kenya and around the world. For details, please refer to the faculty's Homepage. Some snapshots of the University building and the local facilities are given here. Workshop posters in printing quality are available as PDF in A4, A3, A2; there is also a low-resolution bitmap in JPEG format.